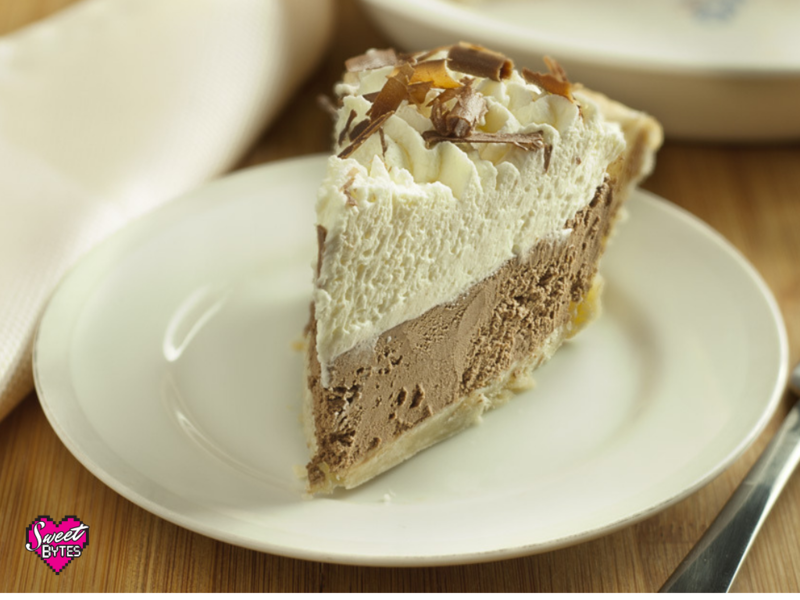 French silk pie is my absolute favorite pie on the planet. Not only was it the first pie I tried to make entirely from scratch, but it also launched Sweet Bytes as a business! Really. 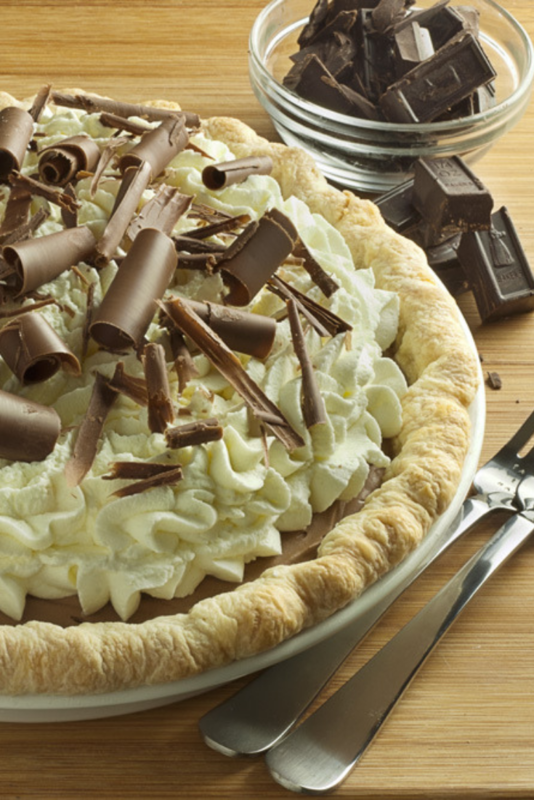 This chocolate pie is so dang good people will offer to give you money to make them one! That’s right, the pie can make it rain. 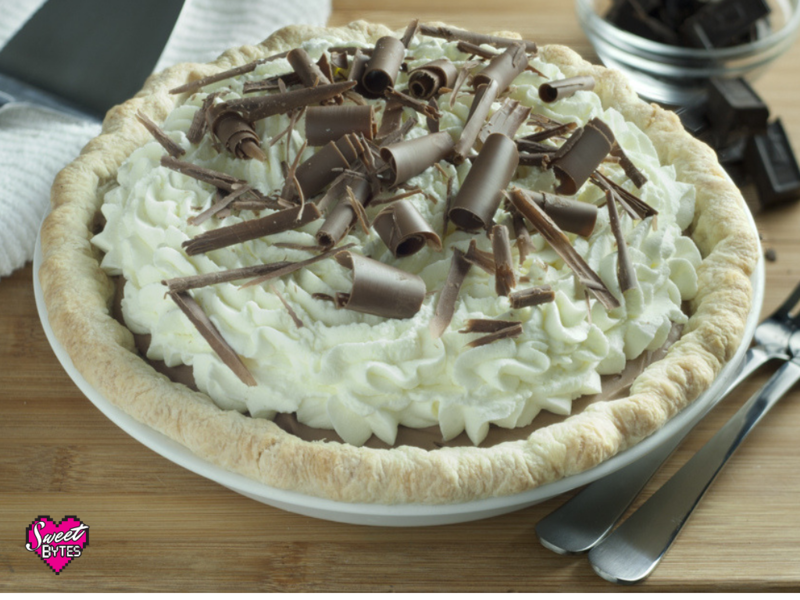 It might surprise you, but French silk pie isn’t French at all. It originated as a contest entry in the 3rd annual Pillsbury Bake Off! This year the 49th Pillsbury’s Bake Off winners will be announced! Truly, this pie has stood the test of time. However, the pie, as well as its inventor, are all American. Funny thing about Americans, whenever something is very fancy, we think it must be associated with a faraway land. For this lovely, rich, and decadent pie, what better place than France? Thus, it was called “French Silk Chocolate Pie”. The original was made with raw eggs whipped into butter, sugar, and melted chocolate. It’s a very dense and silky chocolate pie that is similar to a mousse, but I dare say even richer. While staying true to the original recipe, I’ve changed the instructions so that the eggs will be safe to eat and everyone can dine without worry! Using pasteurized eggs or egg product would also work. I just got tired of having to hunt all over town for the one pasteurized whole eggs I knew of and I am not a fan of egg product. Very simple ingredients make it even more amazing to me! 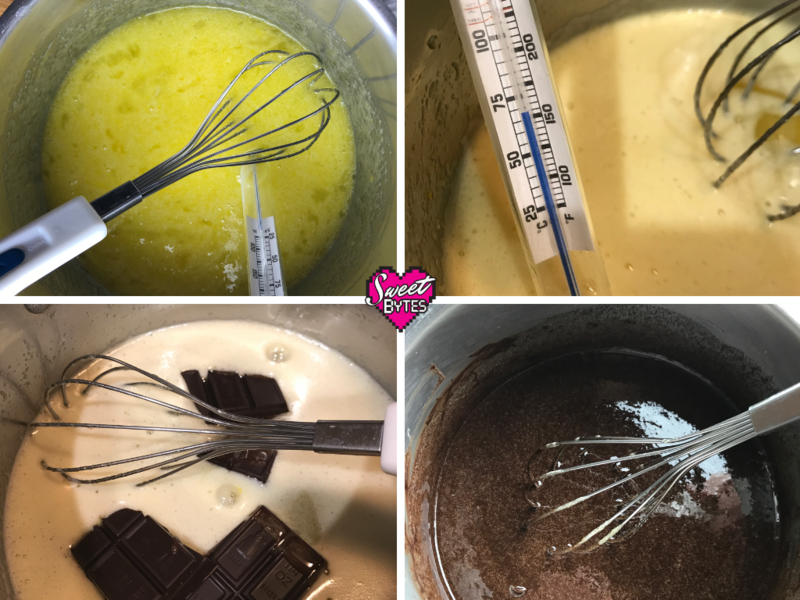 A way to gauge the temperature of the egg/ sugar mixture is necessary to guarantee any bacterial risk from the eggs has been eliminated. 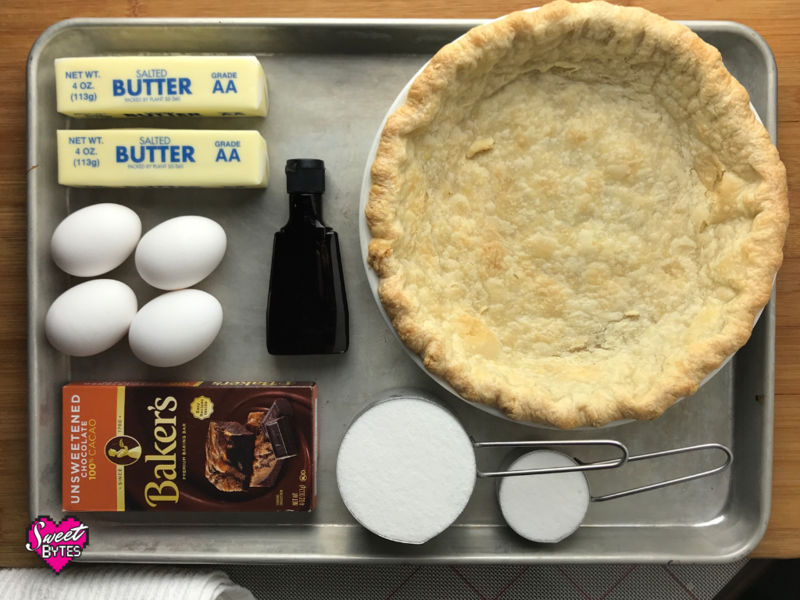 I can’t tell you how excited I am to show you how to make my favorite pie. 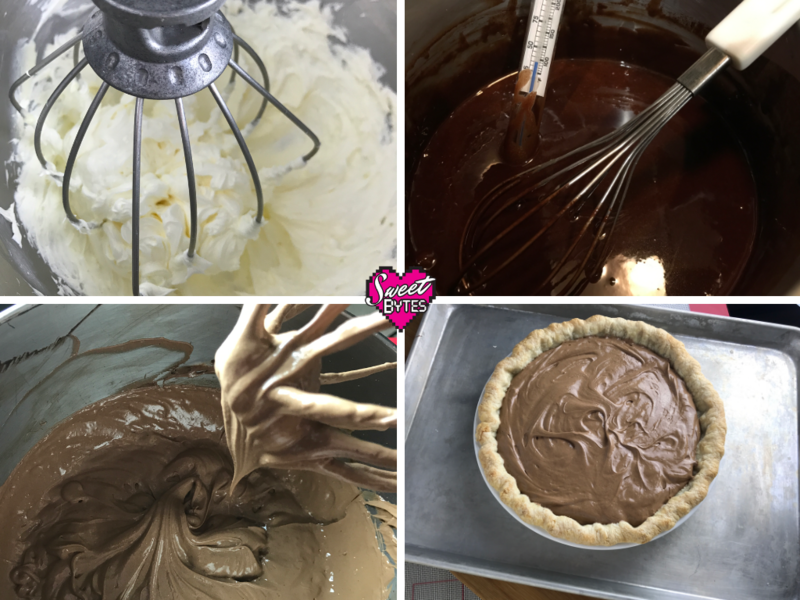 It has a no-bake filling, but there are a few crucial steps that I would like to walk you through, You know, just to make sure you have French silk success! To make the pie, gather your ingredients and make sure that you are prepared to make the pie. Set out the butter so that it can soften at least 30 minutes before you prepare the pie. Next, you’ll need a pre-baked pie shell. I usually use my flaky, all-butter pie crust. You can get the link to that recipe here. I bake it until it’s golden brown. Since the pie filling isn’t baked, the pie crust has to be completely baked beforehand. A good chocolate crust or graham cracker crust would also work well with this filling. Set your crust aside and prepare the filling. Crack your eggs into the small pan, add the sugar and whisk together until the sugar and eggs are well mixed. Clip the candy thermometer to the side of the pan and set the pan on a stovetop over low heat. Do not be tempted to speed up the process by raising the heat. You’ll cook your eggs and then you won’t be able to use them. Whisk the mixture slowly but continually until it reaches 145 degrees. At this point, I remove it from the heat, continue whisking and watch the temperature on the thermometer. The temperature must stay at 145°F or higher for 15 seconds to kill any unsafe bacteria that could be in the eggs. Usually, my temperature continues to rise up to about 155 after I remove it from the heat, but I stay near the stovetop in case I need to place the pan back on the burner. If your temperature drops below 145°F before 15 seconds is up, start over on the heat. This is an essential step that has to be done precisely to avoid the risk of salmonella. If you don’t have a candy thermometer, you can heat the mixture until it’s steaming and continue for 15 more seconds. That should be good, but really a thermometer is your only guarantee. Next, break up the bar of unsweetened chocolate into chunks and put it in the hot egg mixture. Stir gently until all of the chocolate is melted. Add the vanilla to the chocolate and continue to stir until the vanilla is incorporated. Allow this mixture to cool to 95°F. Stirring occasionally while it cools so that it stays smooth and no weird skin forms on the top or anything. When the chocolate mixture is cooled, pour it into the whipped butter. Beat on high for 10 minutes, scraping the bowl as necessary to incorporate all of that delicious chocolate and butter. If you are using a hand mixer, I’m sorry. It’s worth it, I promise. Pour the French silk pie filling into your pre-baked pie shell, cover, and refrigerate for at least 4 hours. If you can wait until overnight to serve the pie, I highly recommend the wait. This pie just gets better with a longer wait. 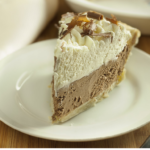 I imagine that it is amazing as is without any topping or extras, but I have to have my French silk pie piled high with whipped cream and chocolate curls or I feel horribly cheated! And I do mean PILED HIGH! Here’s a link to my stabilized whipped cream recipe. I double the recipe and put ENTIRE batch on top! Feel free to use more or less, there’s no whipped cream shaming here. However, it is important to use stabilized whipped cream if you are going to decorate the whole pie. Otherwise, the whipped cream will return to a liquid state or go soft on your pie and ruin your beautiful presentation. French Silk Pie is the most decadent and delicious chocolate pie recipe I know. It's a no-bake pie traditionally made with raw eggs, but the danger from using raw eggs is removed in this recipe by heating the eggs and sugar together to 145°F before adding to the pie! ENJOY! Crack the 4 eggs into a small pan, add sugar, whisk until well mixed. Clip the candy thermometer to the side of the pan, place egg mixture over low heat, stirring constantly until the temperature reaches 145°F. Remove pan from heat, but make sure the mixture stays at 145°F or higher for 15 seconds. Add the unsweetened chocolate to the egg mixture and stir gently until all of the chocolate is melted and smooth. Add the vanilla extract and stir to incorporate. Allow the chocolate mixture to sit at room temperature for 10 minutes or until it reaches 95°F. In a large mixing bowl or the bowl of a stand mixer, whip butter on high for 5 minutes until it is light and fluffy. When the chocolate is cooled, pour into whipped butter. Mix on high for 10 minutes. Scraping the bowl as needed to blend in chocolate and butter. Pour the chocolate pie filling into the baked pie crust, cover and refrigerate at least 4 hours. Garnish with whipped cream and chocolate curls before serving. Refrigerate leftover pie up to 7 days. I hope that this becomes a favorite of yours like it is mine. If you have any questions or would like to let me know what you thought of the pie, leave a comment or send me an email! I also invite you to subscribe email newsletter, it’s free! I usually email about twice a month to let you know all the delicious news.